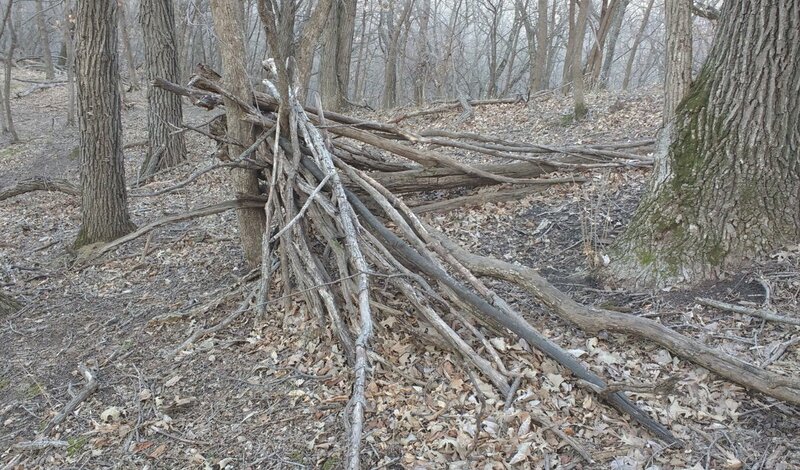 I believe a whole bunch of structures found in the woods are old hunting blinds that hunters build. I know my son and I have built many. Now those X structures,,, I just don't know there!! Some see a bent tree and only see bigfoot at work!! I'd be curious to know what the blinds that you built look like. 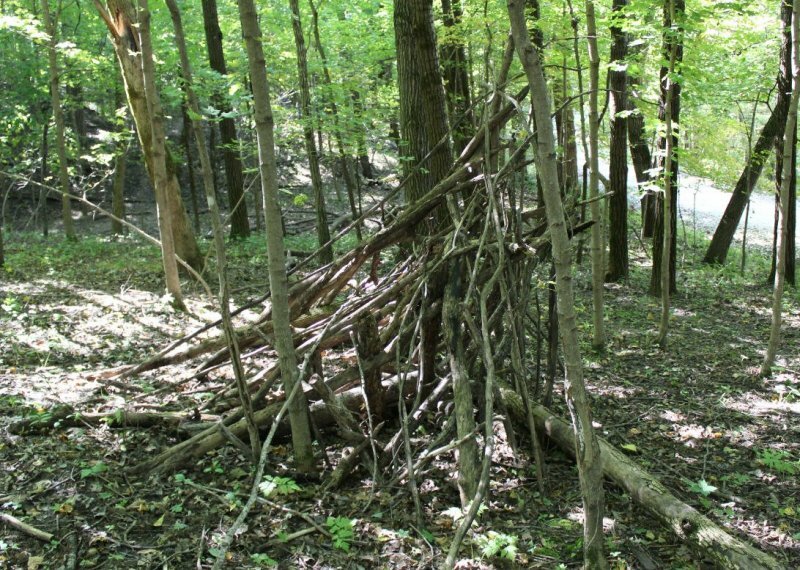 Here are two structures I found last year. I agree with Norse. They are most likely omnivores that spend a lot of time grazing and eating. Building up a reserve for winter. That would be geographically specific obviously, as the Florida (Southern) populations for example wouldn't need any such thing regarding winter focus. Food gathering must take top priority for them however, wherever they are., irrelevant of social structure i would have thought too. They spend time on human forums debating the possibility that humans may or may not exist. P G, that's plain ridiculous. Even to Sasquatch the existence of humans are a given. No, I'm sure they are more likely debating on weather a human can cut a tree down and lift it without anything mechanical or what a human does all day. Sheesh! I think Norseman is most likely correct. So far as building structures, I'm not sure, but if they do, they are for a purpose. It takes time and calories ... not something a primitive person without agriculture has any abundance of. We may not understand, or agree on, what the purpose is, but if bigfoot is doing it, it has a purpose. I think they are primarily nocturnal but not exclusively so. Mostly during daylight they are sleeping, but not exclusively so. Some activities would seem to require better light. Trying to catch fish in streams ... you need to see into the water to see fish. Daylight isn't an absolute must but it would be pretty close. (Watch the live bear cams from Brooks Falls in Alaska .. there are some bears fishing at night, but many fewer, and it may be the more marginal ones that can't compete with the dominant bears who are present in daylight.) Scanning the landscape planning travel routes .. they don't just bumble along. ... and there does indeed seem to be some amount of time spent watching us based on reports. Whether that is "curiosity" or trying to keep an eye on a potential danger (us) is anyone's guess. Any good bear worth his angling salt knows like the Madison River guides do, that the lunkers come out at night! And the competition is snoozing. I wonder if we look blurry to them. I mean the Bigfoots of course, not the lunkers. Humor not exactly your fortay.